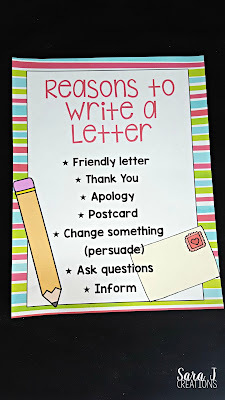 Have you every taught your students how to write a letter? An actual paper letter? Not an email but a letter you send in the mail. It is a dying art but it is a fun and important unit to teach. Letter writing was one of my favorite writing units to teach my second graders, so I was naturally overjoyed when my 4 year old suddenly developed an interest in writing and mailing letters. Her excitement came from her new found ability to write letters and words and a picture book we have called Stanley the Mailman. She loved all the pictures of the different supplies they might use in a post office and requested her own. Because I used to teach this unit every year, I had some supplies in the basement and ran out and found a few more for her at the Dollar Tree and Walmart. To say she was excited with this new dramatic play area is an understatement. We have had it up for over a month and she still goes in there regularly to write letters. While I pulled out letter writing paper and the mailbox that I used in the classroom, I didn't do any real instruction on how to write a letter because I know she is a little young for that. 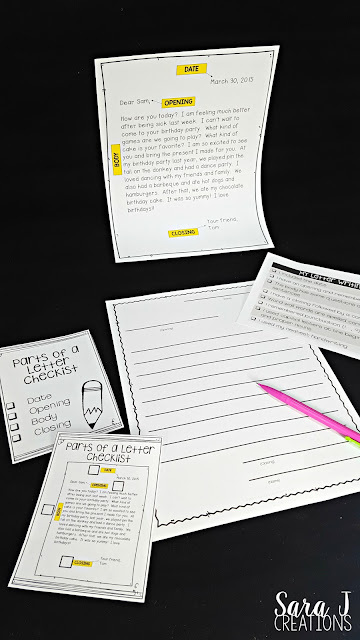 It got me thinking though about teaching the unit in the classroom and I thought of some ideas to make teaching a letter writing unit easier in your classroom. When do you find the time? Is this in the curriculum? And the answer for me was that no it wasn't officially part of our curriculum. We found that taking a few weeks at the beginning of the school year to teach a letter writing unit was so beneficial. We started the year by introducing writer's workshop, what it was, what the expectations where, where the supplies were, etc. Then after two weeks of that we would do a letter writing unit before we jumped into any of the curriculum required genres. This worked for several reasons. First, it is a fun unit. 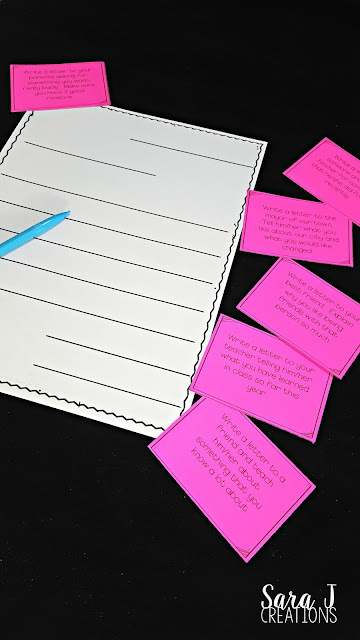 My students loved it every year so it was a way to get them to love writing from the beginning. Second, it set the expectation for the rest of the year that they knew how to write letters so if I gave writing a letter as a reading assignment or asked them to write a letter home to their parents or an apology letter to a friend they hurt, they knew how to do it. There are so many GREAT books out there that show examples of letters and share different reasons why we write letters. 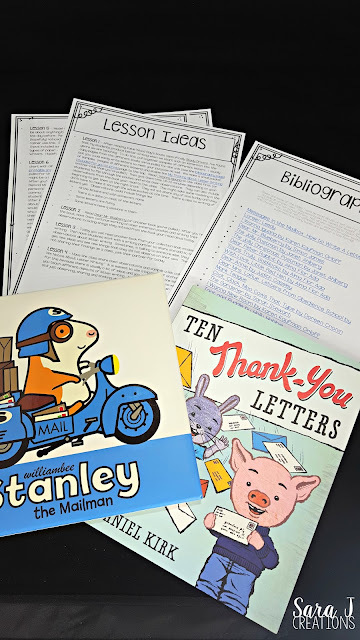 I compiled a list of some of the books I used during this unit and it is included in my Letter Writing unit. I'll highlight just a few favorites and why I love them! Ten Thank You Letters is a new to me book so I didn't have it when I was in the classroom. I like it because not only does it show letters in action, but you also see one character who writes quick letters and his friend who takes his time and adds lots of details to his thank you letter. This was something we were always talking about - adding details to the letter and what else can you write about in a letter. I Wanna Iguana is a funny story of a mom and son writing back and forth in letter format as he tries to persuade her to let him get a pet. I like to use it as an example of one reason why we write letters - persuade people. Dear Mr. Blueberry is a cute story about a little girl writing letters back and forth to her teacher. It is great to show the format of a letter. Anchor charts were crucial to teaching writing and I created several over the course of our letter writing unit. I even made small version that my students could have right at their desks. 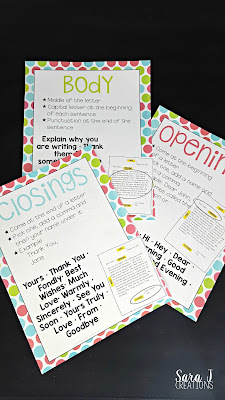 Not only did we create charts about what to include in openings, closings and the body of the letter, but I also wrote sample letters that they could refer back to as they were writing. This just really helps them to get a clear idea of what letters should look like and different ideas for what to include. With my second graders, I would make sure that a few days of our unit were spent learning how to address envelopes with the key skill here being learning their own address. It was scary how many of them had no idea what their address was. They would tell me the subdivision they lived in but that was it. 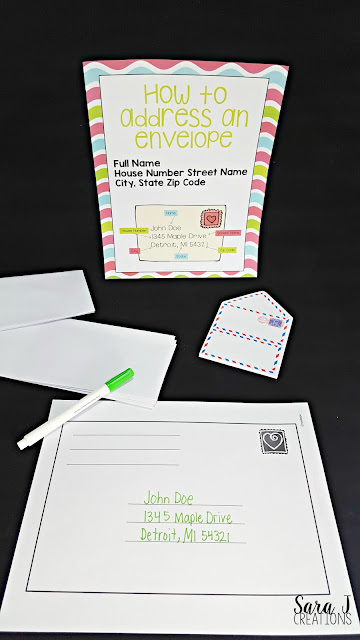 We would practice the correct format for writing an address and it was an expectation all year long that when they wrote letters and put them in envelopes, they would write their return address on it. -write thank you letters to volunteers, guest speakers, visitors, etc. 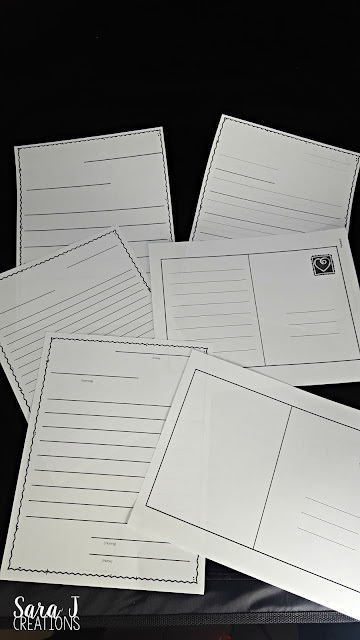 I could go on and on with ways to make writing applicable to your students, but the point is that once the unit stops, the letter writing doesn't have to stop. I set up a letter writing center in my classroom that was similar to my daughter's dramatic play version. I included different types of writing paper - various lengths and line sizes. I also included envelopes, blank cards, seasonal paper or stationary, stickers, stamps, and small anchor charts. I created a class address book that they could use to write a friend's address on the envelope. We never sent these in the actual mail but I bought a plastic mailbox for the classroom and we put the letters in there and delivered them weekly. You could also include picture books about letter writing. I liked to include some prompts for writing letters for friends that got stuck on what to write. 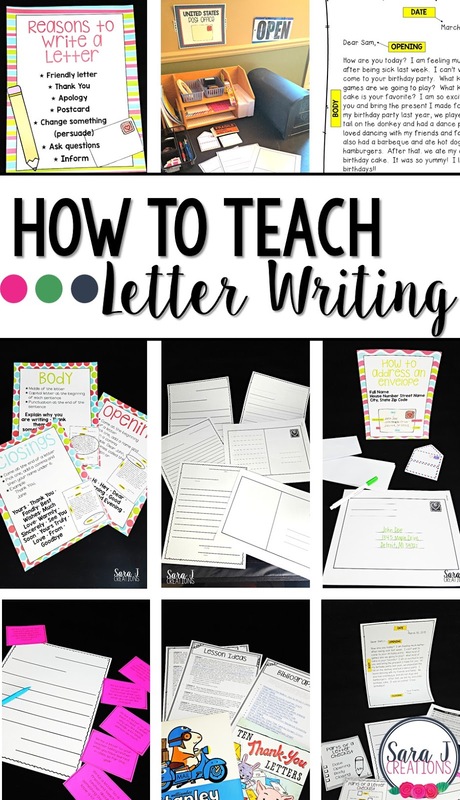 I hope this gave you a few ideas for how you could start incorporating letter writing in your classroom. It can start out as a dramatic play area for younger children and develop into a letter writing unit where lower ele students learn the correct format and then take it a step further and have upper grade students focus on types of letters and writing persuasive letters. 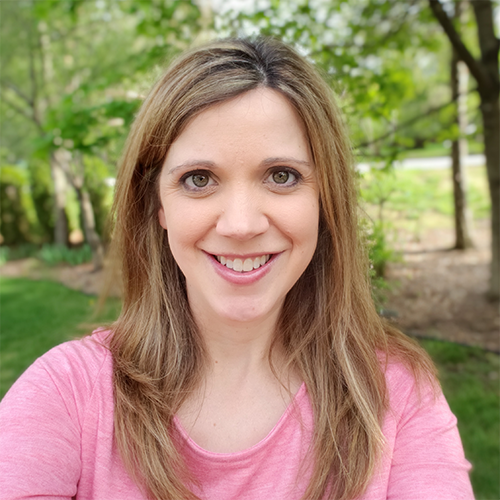 You can find my letter writing unit HERE to get you started. You've inspired me to set up a writing station for my girls. So many great ideas, thanks! You're welcome, Caty! Thanks so much for commenting. I bet your girls will love it. Even now that I've put most of ours away, my girls still write letters at their little desk. Such a good life skill.